Perfect for inboard or outboard power boats and sail boats. Compatible with EVC systems. The NAVpilot series have the capability to work with Volvo Penta IPS, Yamaha Helm MasterTM, Yanmar 8LV engine systems and Seastar Optimus360 Joystick system. Simplified activation set-up by on-screen wizard. The SAFE HELM temporarily switches the NAVpilot to manual steering for a specified time interval, taking it out of an automatic steering mode (AUTO, NAV, etc.) After the time interval has elapsed, SAFE HELM is deactivated and the previous automatic steering mode is restored. * Required Options - HRP11 or HRP17 Pump and FPS8 Power Steering. ** Based on Furuno testing and "Scenarios for a Clean Energy Future 2000” - U.S. Department of Energy (www.ornl.gov/sci/eere/cef). "Precision" XTE accuracy: within 0.003 nm. 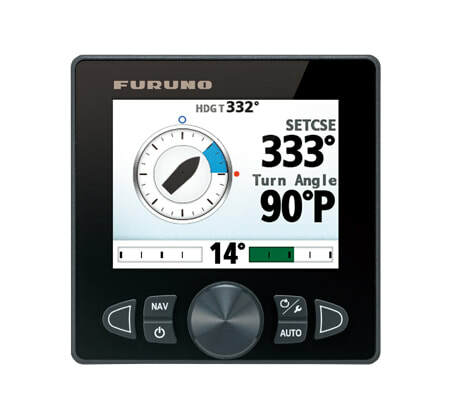 FishHunter: The NAVpilot will activate the FishHunter to perform square, zigzag, circle, orbit, spiral or figure eight maneuvers around the specified target at a user selected distance. This feature can also be used for Man Overboard (MOB).